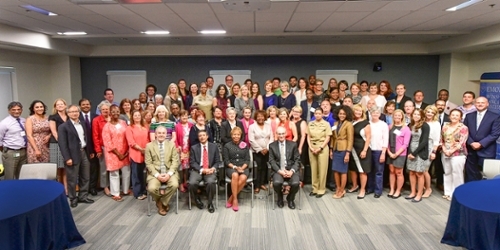 Winship Cancer Institute of Emory University was among only ten cancer centers around the country to hold a regional Cancer Moonshot Summit on Wednesday, June 29 at the same time that Vice President Biden convened a session in Washington, DC. More than a hundred cancer researchers, clinicians, advocates, public health officials and patients in attendance were tasked with coming up with ideas to report back to the Vice President's office. The goal of the Cancer Moonshot is to double the rate of progress in cancer prevention, diagnosis, treatment and care over the next five years and to ultimately end cancer as we know it. These regional summits are the first time that individuals and organizations representing the entire cancer community have joined the national charge to accelerate progress against cancer. The day included a live feed of the Vice President's remarks opening the summit in DC and round table discussions of critical topics. Follow the Winship Cancer Institute page on Facebook to view video clips from the summit.